August: What we're up to! 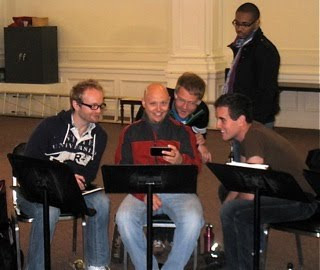 Here's the new soprano section ( Michael McNeil, our twittermeister Gregory Peebles, Casey Breves) + Jace + Cortez, starting the day as usual viewing something on the I-phone. 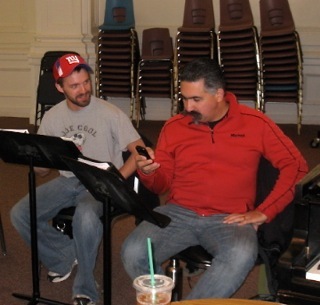 Same activity over in the bass section, where Michael Axtell has taken up residence. Today we're working on Britten's "Hymn to Saint Cecilia." Tomorrow Mason Bates will come along to help us on the new piece we commissioned for "Out of this World!" the new program we'll be singing for you soon. 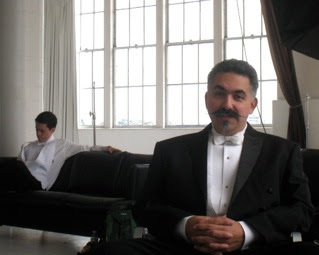 Mason's piece is called "Observer in the Magellanic Cloud," in which the voices of ancient maoris are heard in said cloud. We're looking for a native maori speaker to make sure we get the text right. Last week we got our new photos done. Eric's done this a lot.